Listed as one of the "CMA's Who New To Watch", National / Nashville Recording Artist Dave Russell is a “Down Home, good ole boy” from North Carolina that has toured the country, performing to sold out crowds in Nashville, Biloxi, Branson, San Antonio, Reno, Tahoe, and most recently all of Northern California. Making his home in Placer County, Dave and his band are constantly one of the "Most Booked Country Bands in California". His vocal talent alone has landed him 2 "Top 40" hits on Country and Christian Country Radio. He also is an accomplished Studio Vocalist providing the voices of countries most recognizable voices for such games as "Time Magazine's Video Game of the year", (Karaoke Revolution), along with "CMT Presents: Karaoke Revolution Country". Dave just recently signed with Cupit Records. Jerry Cupit, who has produced such artists as Ken Mellons, Tim McGraw and Lonestar produced the new project and is "excited to have Dave on the label". 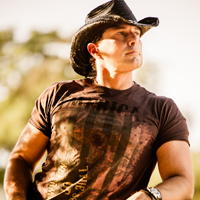 Dave released his debut single "Where the Money Goes", in 2012 to wide acclaim from country radio and his "Home Spun" video for the song has been featured on several programs, along with creating quite the buzz on Youtube. Dave's social media fanbase continues to grow along with the demand for his appearances at events all over the country. Dave, along with Cupit Records, is gearing up for the release of his newest single, "How Country is That". Dave's touring and show schedule continues to keep him out and performing to sold out crowds. As a Transplanted North Carolinian, Dave brings a true voice and attitude to every event where he performs. His energetic stage presence never fails to excite the audience, as "getting people going" is Dave's priority goal. Dave is considered by many, to be "The Total Package", of performers, (looks, talent, and positive attitude), and that number grows each and every time he steps on stage. Check out Dave Russell at your nearest venue, follow him on social media, and be sure to let your local radio station you want to hear his new single, "How Country is That".